bean poles | Digging for Victory! I thought l would add a few photos of the garden as it is not normally quite so weed free but with the long hot dry spell the weeds are slow in returning. 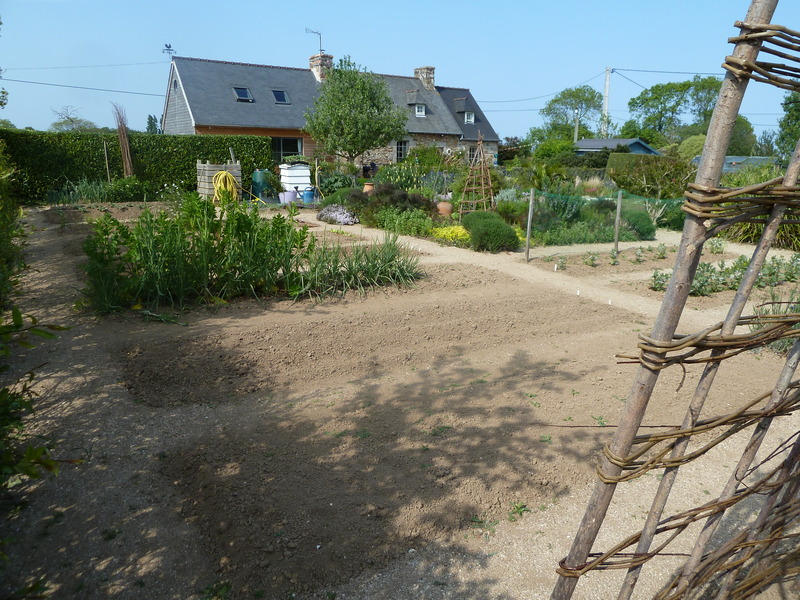 The potager takes up half of the garden. The other half is made up of two large round grassed areas suroounded by various shrubs, grasses, trees and flowers. The beehive is actually a compost bin l made some years ago following a Geoff Hamilton design. 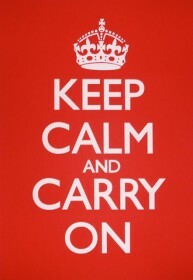 It fools everybody! The garden is made up of deep-beds with paths made up of crushed sea-shells. I don’t use weed-killer on these paths but hoe them all as and when. The hot, dry April is making it very hard to get the seeds going. I soak the row first before putting in the seeds hoping this gives them a head start but l am having to water every 2 or 3 days or else l would loose most things. The peas are a bit slow emerging but l am sure they will be romping away now. 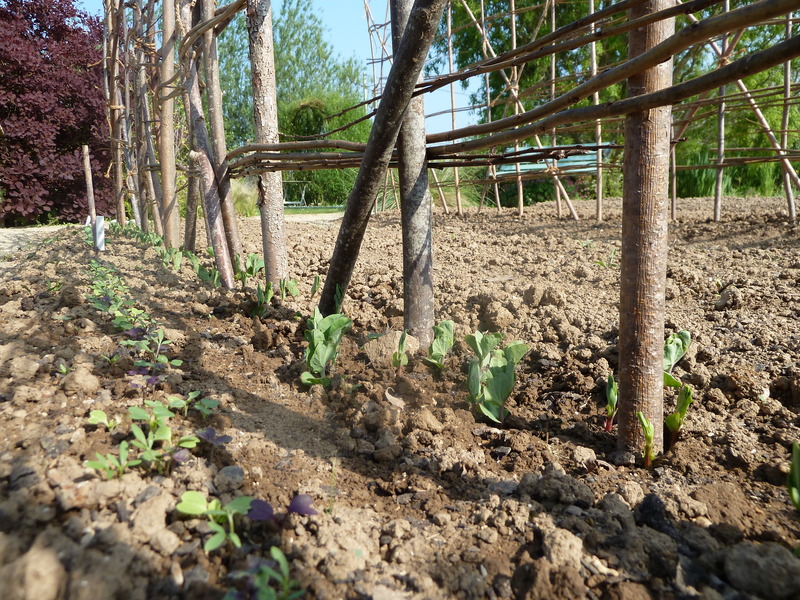 In front l made a small sowing of lettuce ‘cut and come again’. 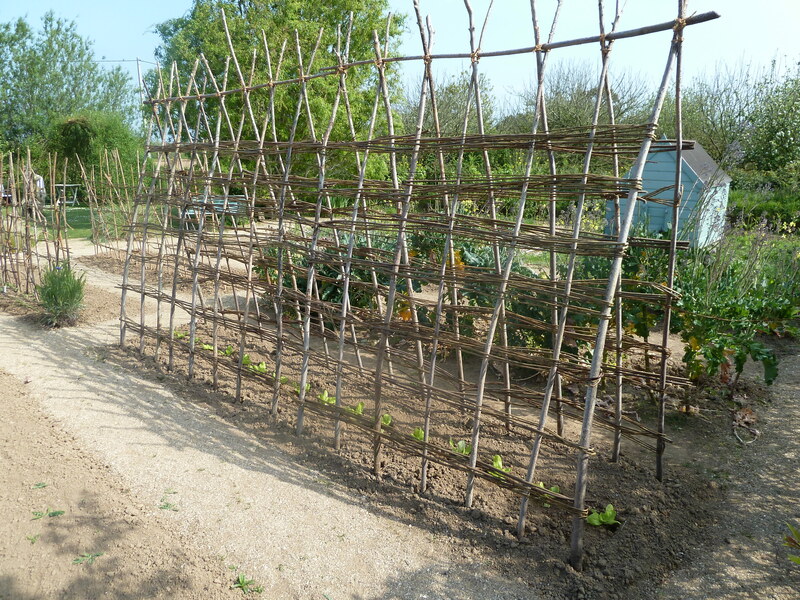 I have been soaking a load of willow over the past week or so and today l weaved some btween the bean poles to give the beans something extra to climb up and make the whole structure a bit stronger. Mrs Hunt finished off the other side and l have to say she made a far better job of it than l did! Did you know its National Bean Pole Week? 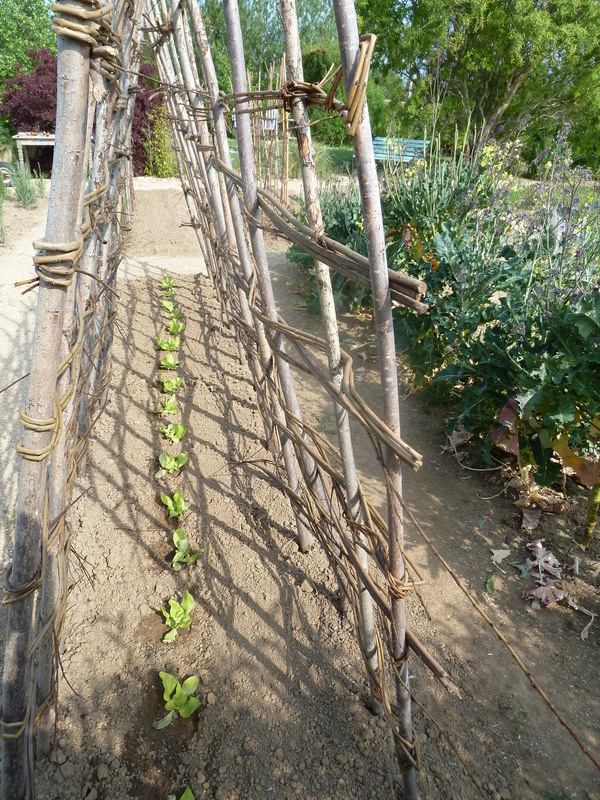 I planted up a catch-crop of lettuce in-between the bean poles. These will be ready by the time the beans have got to the top of the poles. It just uses up what would otherwise be a waste of good soil. 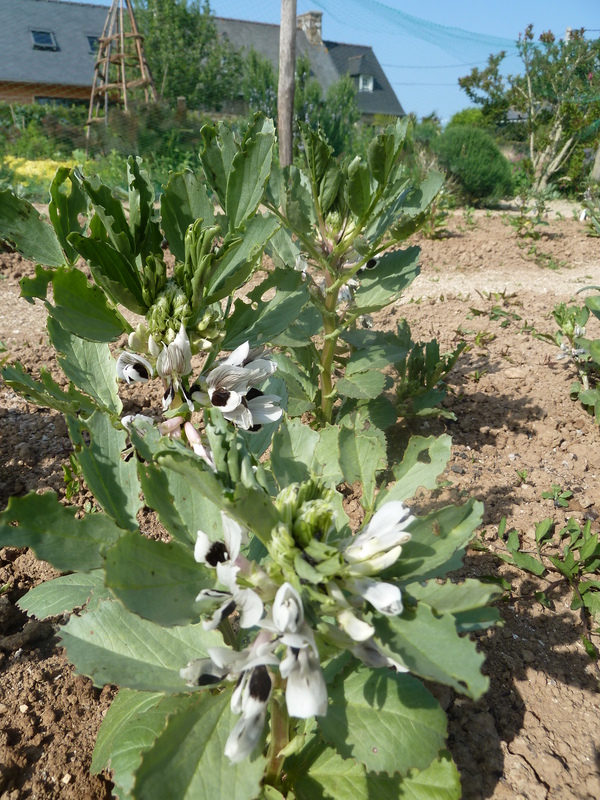 The broad beans are flowering well and look set to provide a good crop but the leaves are being eaten by something. It’s not the dreaded blackfly so not sure what it is. 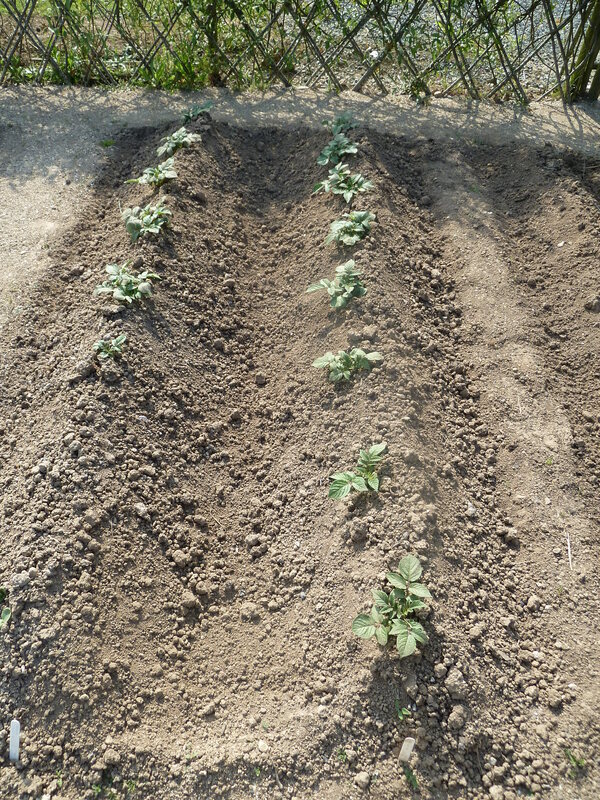 The early potatoes l put in not so long ago keep appearing above the soil l earth up over them. I have almost run out of soil so they will now have to take their chance if there is a frost. My greenhouse is fit to bursting with courgettes, pumpkins, squash, runner beans and tomatoes that really need to be planted out but if there is a frost, and there well could be, l stand to loose the lot! 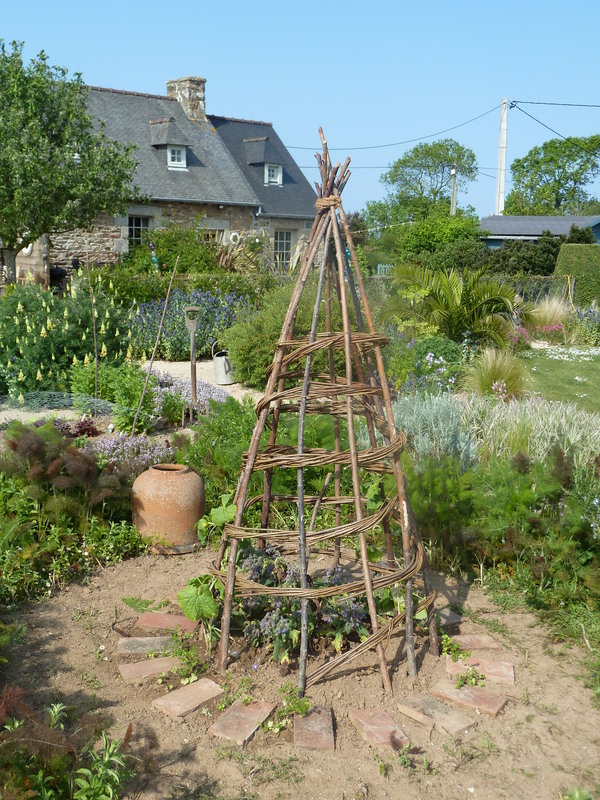 I made up this willow wigwam today as well. I planted a couple of cucumber plants either side and the rest will be planted up with Sweet Peas. 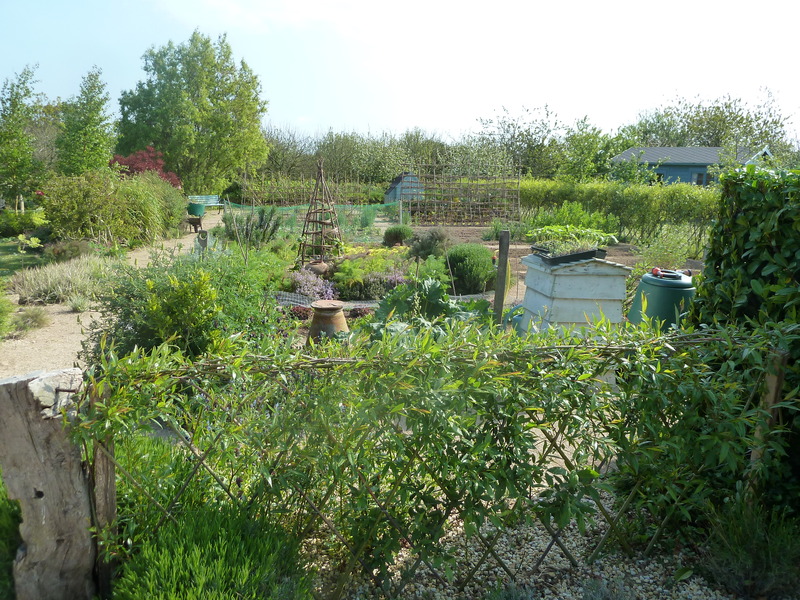 This area still needs a lot of work as it is the herb garden and needs a lot of sorting out. The ground is really hard here so might wait until after it has rained. The weekly jottings of Mr Middleton for the 4th week in April and the weeks of May were covered last year but l will be looking at the Dig for Victory leaflets and see what they have to tell us.I have been making some purchases on ebay over the past few weeks of old WW2 Dig for Victory memorabilia. There are some serious buyers out there and one small leaflet recently fetched nearly £70.00! More details on another post.